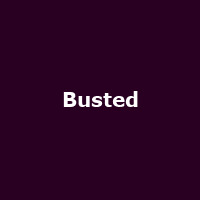 Busted are a British boy band, formed in 2002 and originally featuring James Bourne, Matt Willis, Charlie Simpson and (briefly) Tom Fletcher. Initially active for just three years, the band had four number one singles ("You Said No", "Crashed the Wedding", "Who's David?" and "Thunderbirds Are Go / 3AM") and both their albums hit the number 2 spot in the UK charts, going multi-platinum. The band split in 2005, reforming in 2015, featuring the original trio: James, Matt and Charlie, releasing the albums: "Night Driver" (2016) and 2019's: "Half Way There". In 2013, James Bourne and Matt Willis joined forces with McFly to form super boy-band "McBusted".